Hazelnuts and raisins are the sources of the nutty and sweet richness of this Pumpernickel recipe. 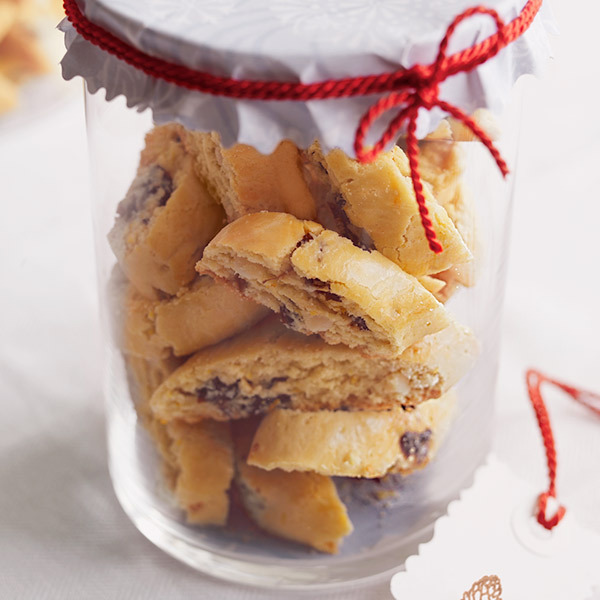 We've used orange and lemon zest to enhance the fruitiness of this traditional holiday staple. For a sweeter treat, try our two variations: White Chocolate-Dipped Pumpernickel and Chocolate Chip Pumpernickel. Preheat the oven to 350°F. Grease two baking sheets. In a large bowl, with an electric mixer, beat the butter and gradually add the sugar. Add the 4 eggs, one at a time, beating well after each addition. On a sheet of waxed paper, sift the flour and baking soda together. Gradually add the flour mixture to the butter mixture. Stir in the grated zests, hazelnuts and raisins. Using floured hands, divide the dough into eight pieces. Roll each piece into a rope about 12 inches long. Place four ropes on each of the baking sheets and press lightly to flatten. Brush with the egg wash.
Bake for 15 to 20 minutes, until light golden brown. While still hot, cut on the diagonal into 1½- inch pieces. Scatter around the baking sheets and return to the oven for 2 minutes. Transfer to wire racks to cool. Bake the cookies as directed. In a double boiler or microwave, melt 12 ounces white chocolate chips with 2 tablespoons vegetable oil, stirring until smooth. Dip one end of the cookies in the melted chocolate and refrigerate to set. Omit the lemon zest. Use mini chocolate chips instead of the raisins.